Jailbreaking is often all about skinning iOS, making things look the way people want them to and giving tweakers the power to alter just about any aspect of the interface, no matter how big or small. But there’s so much more in jailbreaking, with some of the best reasons to go through the process being some of the tweaks that add functionality that Apple would probably never sanction. With iOS 7, Apple gave Notification Center much more of a useful role than it ever previously had. Now, post iOS 7, iPhones and iPads have a page within Notification Center that offers information on calendar events and travel times to locations that are frequented. It gives Notification Center a role that goes beyond push notifications, but many would argue that it falls considerably short of what it could, or perhaps should be doing. 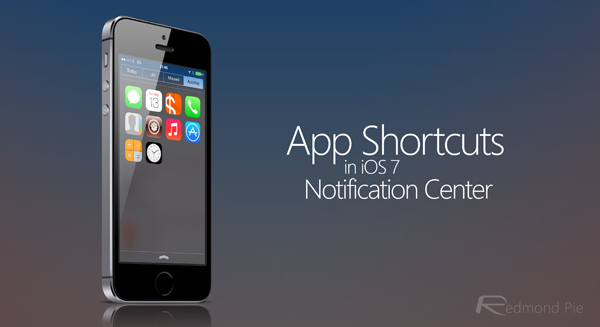 A new tweak that is specifically designed for iOS 7 and its revamped Notifcation Center is Apptray, and it’s available to download via Cydia now for $1.49. What it offers is possibly something that we’d all have liked Apple to make available as standard – a Notification Center pane with a collection of app shortcuts inside. Of course, that might not seem all that interesting until we are reminded that Notification Center is available at any time, and anywhere throughout iOS including inside apps. Having apps available to be launched constantly can be useful because it means that switching to, say, Messages in order to read a new iMessage takes less tapping and 100% less pressing of that weary old Home button. If you’ve been wanting to add different apps to Notification Center, then this is the next best thing. In fact, owing to the fact that there’s more room inside Notification Center, we’d even argue it’s a better alternative entirely. Apptray is compatible with any device that runs iOS 7 and is available to download from the BigBoss repo in Cydia for a price tag of $1.49, with the apps being shown inside it being configurable via the Settings app, just as they should be. We’re willing to bet that Apptray, or at least some iteration on it will be very popular amongst power users, especially if they have a handful of apps that they’re always popping in and out of. Like the people that are reading this, then.